Description: 561 sits on the turntable in Waterville. Title: RY-2 working Whitefield, NH. Description: RY-2 working the B&M interchange in Whitefield, NH. 684-576-561-671B-671A. Description: The clouds are thinning by the time RY-2 completes her pickup, sets the signal for the proverbial "high ball", and heads on to St Johnsbury. 684-576-561-671B-671A. 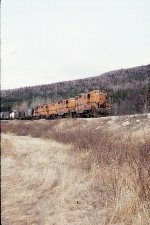 Description: (GP-7) at the "Girders"
Description: A freight off the Lower Road heads for the yard at Brunswick Maine in August 1978. Soon it will be impossible to photograph from this angle as Maine has begun construction of a multi-modal station to service a desired extension of Amtrak service up from Portland where I am standing. The original MEC station was behind the train. Date is approximate. 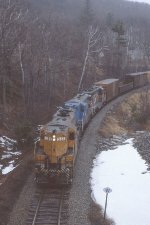 Description: A freight from Augusta is about to pull into the yard at Brunswick Maine in August 1978. Date is approximate. Description: 561-565-591-253; note brake shoe smoke!! Description: Maine Central Railroad GP7 561 at South Portland, Maine on May 9, 1984, Kodachrome by Chuck Zeiler. 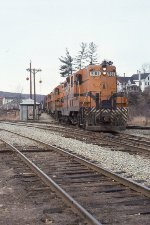 Description: Portland Terminal S3 1101 and Maine Central GP7 561, South Portland Maine, May 9, 1984, photo by Chuck Zeiler.